When you reach Shangri-La Hotel, Bengaluru, in the heart of India's Garden City, you marvel at the elegant double-height lobby and enjoy a refreshing cup of tea while live piano music plays in The Lobby Lounge. 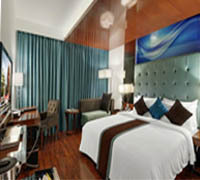 Shangri-La Hotel, Bengaluru comprises a luxurious collection of 397 guestrooms and suites. 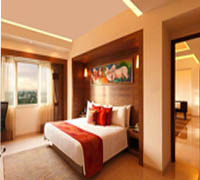 All rooms are stylish and spacious, with contemporary furnishings and spectacular views of the low-rise cityscape. 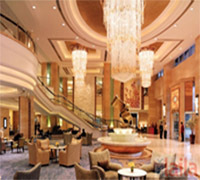 Shangri-La Hotel, Bengaluru, is the largest Food and Beverage destination in the city. The hotel's restaurants include Saffron, Shang Palace, Yataii, Caprese, Lobby Lounge, and Hype, an open-air rooftop bar with stunning views and a party deck. The plush and spacious interiors at Lemon Tree Premier take the zing up a notch. Lemon Tree Premier pampers the style conscious and upbeat traveler with its personalized services, premium in-room amenities, award winning restaurants and fun experiences. Modern rooms with warm decor provide satellite TV, free Wi-Fi and minibars, as well as safes, desks, and tea and coffee making facilities. Some add lake or city views. Suites add living rooms, separate sitting areas, and microwaves; some have Jacuzzis. "The Elanza Hotel" is located in the heart of Bangalore's central business district on Richmond Road close to MG Road & Brigade Road. This is a premium luxury boutique hotel offering upmarket modern, well-appointed comfortable rooms and personalized services, to suit the needs of both the business and the leisure traveler. The location makes it easier to access the major IT parks, ITPL, Electronics City tech hubs, places of tourist interest and shopping areas of the beautiful garden city of Bangalore.